Recently there has been a fundamental change in our understanding of how biological systems operate; new research revealed that quantum phenomena could play an essential part in biological processes. Understanding the fundamental mechanisms contributing to biological processes is an essential step in developing our understanding of life, its origins and evolution. However, one has to be cautious how to approach this problem to avoid triviality. Molecules are purely quantum mechanical objects which must behave according to quantum mechanical laws. Therefore life is governed by the laws of quantum mechanics; it is the result of a series of chemical reactions between molecules happening inside of any living organism. There is nothing insightful in this observation. However, if one could demonstrate that biological systems utilize certain peculiar aspects of quantum mechanics such as coherence, entanglement or tunneling to their advantage, it would be a highly non-trivial statement. Scientists have recently discovered strong evidence for complex quantum mechanical mechanisms in two interesting biological processes: photosynthesis  and the avian compass [2,3]. In this article I would like to focus on the latter. It has been observed that some species of migratory birds can sense the direction of the Earth’s magnetic field. They use this sensitivity to the geomagnetic field to navigate during seasonal migration. This is extremely surprising because the magnetic field of our planet is very weak and it is difficult to imagine how it can affect a bird’s nervous system or trigger a behavioral response. In 2008 scientists realized that birds may directly observe the magnetic field by utilizing a magnetically sensitive photochemical reaction called the radical pair mechanism. In a nutshell: it is assumed that the bird’s retina contains a photoreceptor pigment with molecular axis direction dependent on its position in the retina. Absorption of incident light by a part of the pigment results in electron transfer to a suitable nearby part and in this way a radical pair is formed, i.e. a pair of charged molecules each having an electron with unpaired spin. In the external magnetic field the state of the electron spins undergoes singlet-triplet transitions and at random times the radical pairs recombine forming singlet (triplet) chemical reaction products. In a bird’s brain, the amount of these chemical products varies along the retina as the direction of molecular axis changes, and the shape of this profile is believed to be correlated with the orientation of the geomagnetic field. I would like to mention at this point that singlet and triplet states of two electrons, which are examples of entangled states, are purely quantum mechanical phenomena that cannot be modeled using classical physics. We need to put this hypothesis in the context of behavioral experiments carried on European Robins. During these experiments researchers determined that (i) the avian compass is only sensitive to inclination of the magnetic field, not its polarity; (ii) investigated birds were disoriented after being subjected to a weak radio frequency magnetic field whose frequency is adjusted to the characteristic frequency of the radical pair mechanism; (iii) the compass stopped working if the local geomagnetic field was weakened or strengthened by around 30%. There are two essential physical parameters, in the radical pair mechanism model, which determine a bird’s ability to navigate: the average lifetime of the radical pair and its robustness to disturbances from the environment. The lifetime of the radical pair must be long enough to produce the chemical product profile necessary to stimulate the bird’s nervous system. Disturbances from the environment is called decoherence in quantum theory. Decoherence directly effects electronic singlet and triplet states making them lose their entanglement. This results in the bird’s compass being insensitive to the inclination of the magnetic field. The coherence time of the radical pair must be sufficient to prevent this from happening. My colleagues from the National University of Singapore and Oxford University (UK) showed, in their recent paper , that both the average lifetime and the coherence time of the radical pair in the European Robin’s eye can be of the order of 100 microseconds. This is a surprising result, given that the longest coherence times of molecular electron spin states achieved in the laboratory (where the influence of the environment is minimized as much as possible) are 80 microseconds! It would imply that evolution created protection for fragile quantum processes beyond what humans can engineer. 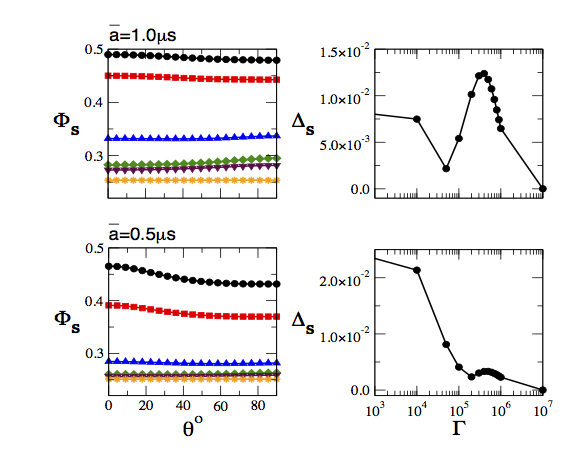 In my recent paper  -- together with my collaborators Tomek Paterek and Jayendra Bandyopadhyay -- we arrived at different lifetime and coherence time estimations based on the same radical pair mechanism model. We estimated that lifetime and coherence of radical pair in the European Robin’s eye is of the order of 10 microseconds. The difference between our results and those in  stems from the fact that we considered all the results (i) to (iii) of the behavioral experiments whereas the result (iii) was not accounted for in the paper by my colleagues. Let me explain this. The graphs above represent the angular dependence of the yield of radical pair chemicals produced in the theoretical model of the avian compass. The black curve corresponds to the local geomagnetic field near Frankfurt, Germany, where the behavioral experiments were carried out. The blue curve represents a static magnetic field that is 30% weaker than the one in Frankfurt. The green curve is the yield in the presence of a weak radio frequency oscillating magnetic field. 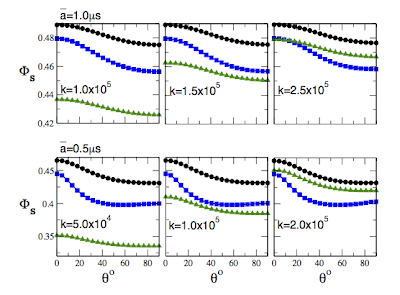 The inverse of the parameter k is the lifetime of radical pair and a parameter in the theoretical model that must be adjusted in order to reproduce the experimental data. According to behavioral experiments (ii) and (iii) a European Robin becomes disoriented if either it is subjected to a weak radio frequency magnetic field oscillating at a specific frequency or if the magnitude of the local geomagnetic field is changed by 30%. Therefore, for those values of the parameter k for which the green curve enters the region (called the “functional window” of the compass) one gets contradiction with the experiment because birds were disoriented in the presence of the RF magnetic field. 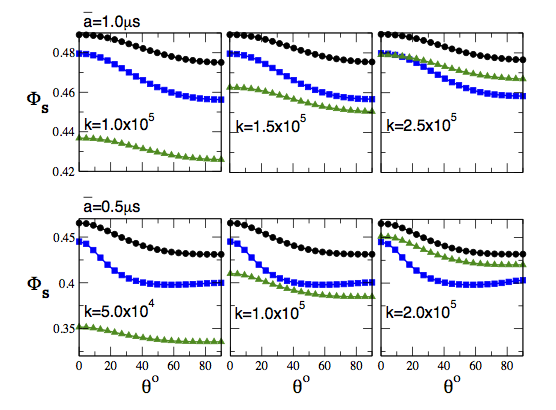 As you can see from the right-most graphs this happens for radical pair lifetimes of the order of 10 microseconds. This is our estimation of the average lifetime of the radical pair in the European Robin’s retina. It also agrees with in vitro experiments on cryptochrome molecules . These molecules are believed to constitute the photo-receptor pigment responsible for the radical pair based avian compass of European Robins. The upper graph corresponds to the situation where the coupling strength of one of the electrons from the radical pair is slightly stronger than the strength of the geomagnetic field in Frankfurt (Larmor precession period of 0.78 microseconds). The lower graph corresponds to where the coupling is slightly weaker. I would like to mention that the compass only works for a small range of the coupling strength centered on 0.78 microseconds. If the coupling strength is larger than the strength of the geomagnetic field then the sensitivity of the compass in the presence of the environmental noise (corresponding to coherence time of the order of one microsecond) is better than if there is no noise! This is not the case if the coupling strength is weaker but we still observe a local increase in the sensitivity for a coherence time of around one microsecond. A similar phenomenon is also found in studies of energy transfer during photosynthesis . A plausible conclusion one can draw from these results is that nature may be optimizing performance of some biological processes by utilizing inevitable noise present in the environment, which is definitely a non-trivial statement about the role quantum mechanics can play in biology. More insight into this conjecture can be obtained from further studies of the resonance that magnetic sensitivity displays as a function of environmental noise -- as identified in this work. Gregory S. Engel, Tessa R. Calhoun, Elizabeth L. Read, Tae-Kyu Ahn, Tomá Manal, Yuan-Chung Cheng, Robert E. Blankenship, Graham R. Fleming, "Evidence for wavelike energy transfer through quantum coherence in photosynthetic systems", Nature 446, 782 (2007). Abstract. Erik M. Gauger, Elisabeth Rieper, John J. L. Morton, Simon C. Benjamin, and Vlatko Vedral, "Sustained Quantum Coherence and Entanglement in the Avian Compass", Physical Review Letters, 106, 040503 (2011). Abstract. Jayendra N. Bandyopadhyay, Tomasz Paterek, and Dagomir Kaszlikowski, "Quantum Coherence and Sensitivity of Avian Magnetoreception", Physical Review Letters, 109, 110502 (2012). Abstract. Till Biskup, Erik Schleicher, Asako Okafuji, Gerhard Link, Kenichi Hitomi, Elizabeth D. Getzoff, Stefan Weber, "Direct Observation of a Photoinduced Radical Pair in a Cryptochrome Blue-Light Photoreceptor", Angewandte Chemie International Edition, 48, 404 (2009). Abstract. 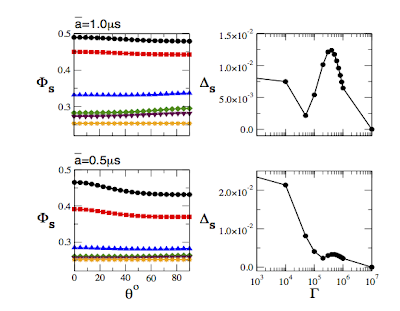 Masoud Mohseni, Patrick Rebentrost, Seth Lloyd, and Alán Aspuru-Guzik, "Environment-assisted quantum walks in photosynthetic energy transfer", Journal of Chemical Physics, 129, 174106 (2008). Abstract.